Belgian forward Romelu Lukaku maintained United’s unbeaten start to the season having scored his sixth Premier League goal of the season to give the Red Devils a hard-fought win against the Saints. It wasn’t the easiest of wins for United as we had to defend deep and hit the Saints on a counter majorly in the second half. The Red Devils are level on point at the top of the table but sit second behind rivals Manchester City on goal difference. However, it was a dramatic end to the game as Manchester United manager Jose Mourinho was sent to the stands by referee Craig Pawson for stepping onto the pitch. It was United’s fourth straight win in all competition since drawing 2-2 away to Stoke at the Bet 365 stadium. Romelu Lukaku might have grabbed the headlines but United’s defence continued their impressive form having conceded just two goals so far in the Premier League this season. Phil Jones was arguably United’s best defender and was faultless having kept Shane Long at bay and clearing anything that came his way. The Red Devils were dominant in the first half but the Saints looked more dangerous in the second half with Oriol Romeu missing his side’s best chance in the 51st minute from six yards. The Spanish international also fired wide in the 77th minute after a lovely move from Dusan Tadic. United have been crying out for a stable partnership at the heart of the defence since the departure of Rio Ferdinand and Nemanja Vidic, and it seems United have found their replacement in Phil Jones and Eric Bailly. 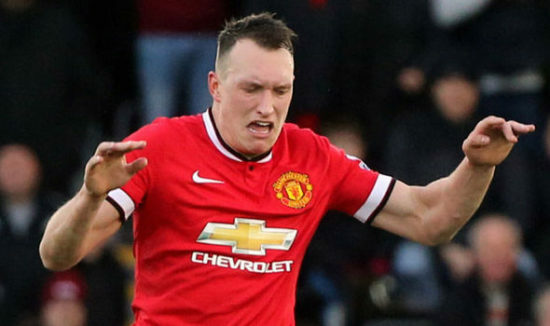 Phil Jones was man of the match for #MUFC and is maybe starting to fulfil his potential at last. Lukaku too isolated up front. English international Phil Jones have been impressive for United so far this season and was solid at the back once again for United against the Saints. He won 5 aerial duels, the most by a United player alongside Marouane Fellaini, completed 90.6% of his passes and had more touches 53 on the ball than any other United defender. The 25-year-old has been plagued by injuries mostly but will be hoping to stay injury free and help the Red Devils in their hunt for trophies this season.